Once you’ve logged into the MySpace application you are presented with your own personalized home screen. 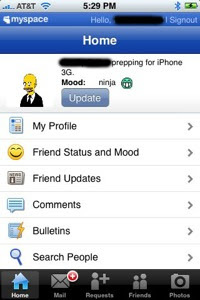 You have immediate access to your mood settings, profile, Friends Status and Mood, Friends Updates, Comments, bulletins, and the ability to search for other people. The interface feels a bit cramped on the iPhone’s screen. Along the bottom you’ll find a row of five buttons that immediately jump to home, mail, requests, friends, and photos. The My Friends section allows you to see your top friends, all of them, those that are online, new friends, and friends with birthdays. You also have complete access to your MySpace email. You can visit your inbox, compose messages and even see your sent, saved and trashed emails. The Mail icon at the bottom of the Apps screen notifies you when you have new messages by displaying a white plus-sign inside of a red circle.